My Landrover has changed colour many times, I just get a can of paint, some rollers and a brush and go for it! The latest colour was a simple matt black. In my spare time I restore antique Danish cast iron stoves that are coated with 'stove black' as a finish. It gives a lovely gun-metal shine to the cast iron. Stove black is basically pure graphite. One slightly lubricated evening my neighbour said 'why don't you stove black the Landy?'. I was not altogether convinced at first, but started on it anyway. The results were quite astonishing, it reflects whatever light shines on it, so on a sunny day it looks silvery-blue, and it has a kind of 'flip-paint' effect, looking black one minute, then gunmetal. 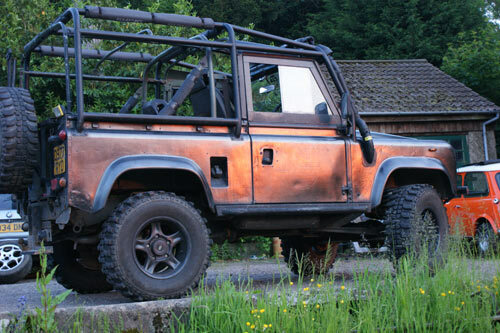 The picture attached shows a sunset reflecting off the car that makes it look like beaten copper.. So if any of you have a ratty old car that needs tidying up, spray it matt black then stove-black it! You will not be disappointed!